Wondering how you could start enjoying all the latest features of our awesome font creation tool? Easy! 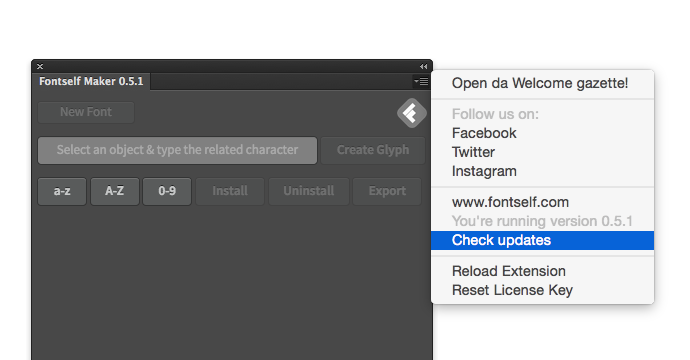 If you’re the lucky owner of a recent version, you will be notified right within Fontself Maker next time you load the panel. Proceed with the installation popup, and TADA! You’ve just updated it. If you’re not that lucky, you will eventually receive an update message directly through the panel’s chat. Click on the link within this message, download the installation ZIP file, and follow the instructions. Didn’t receive the message? No problem, just manually launch the update process from the top right menu drawer (see below). Last resort, just manually request the latest installer here.